There is nothing greater than a old thrifted white shirt. I am all about shirts especially when they come from another era. I found this one a year ago in Barbes and by its shape and mostly the epaulettes I knew it came right from the 80s. I started imagining the woman who had worn it to work, how cool she must have looked. I cut off the cute epaulettes in order to mordernize it - and because even though they were cool they didn't flatter my shape. Les frippes = la joie. Surtout lorsqu'on trouve des trésors venant d'une autre époque. En dénichant cette chemise chez Guerrisol, l'antre de la friperie parisienne, j'ai toute suite su qu'elle avait fait fureur dans les années 80. Les détails dentelés sur le col et les épaulettes ont bercé mon âme de blogueuse fanna de chemise longues et elle a fini dans mon panier. J'ai - à mon grand regret - du couper les épaulettes pour la remettre dans l'air du temps, mais surtout parce qu'elles me donnaient des épaules de nageur olympique pas flatteuses du tout. 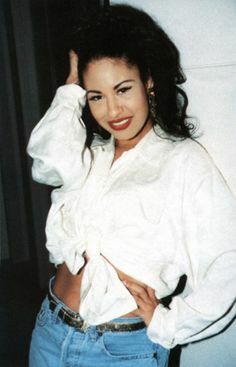 The sleeves and the flowing material remind me of Pirates of the Carribean which will be back soon in theaters (I am soooo happy about that), but they also remind me of Selena Quintanilla especially on this picture. Fun fact: I bought this shirt last year but actually started wearing it only a few days ago. What the heck? You tell me. That is usually what happens when you buy too much clothes but only wear three items in your wardrobe all year around. I am trying to break the circle and wear much more clothes. But it is still hard not to pick up my casual outfit when I wake up late to go to uni. Les manches et la matière assez fluide m'évoquent Pirates des Caraïbes (qui revient bientôt au cinéma d'ailleurs trop chouette! ), mais surtout Selena Quintanilla sur cette photo. Petite anecdote pour la route : même si j'ai acheté cette chemise l'année dernière je n'ai commencé à la porter que récemment. What? Même avec un dressing plein à craquer, le matin la flemme s'empare de mon corps et mon âme et je finis toujours par porter les mêmes fringues. J'essaye de varier même si c'est la guerre vs. la flemme chaque matin. This white vintages skirt is so pretty! I liked the whole look dear! It is a chic vintage shirt for sure. I love the collar details, lovely and you dressed it well.